Exeter Cathedral, Exeter, Devon. Information, Photos and Reviews. 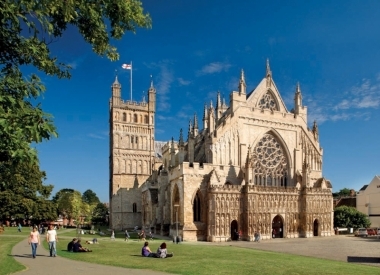 Exeter Cathedral is a testament to the creativity, skill and devotion of those who built it. Dating back 900 years, it is one of England's most beautiful medieval cathedrals and one of the finest examples of decorated Gothic architecture in this country. It is most famous for its two Norman towers, impressive west front carvings and the longest unbroken stretch of Gothic vaulting in the world. Of note are the Minstrels' Gallery, the 15 Century Astronomical Clock, a complete set of Misercords and the highly decorated tombs, bosses and corbels. The library contains the famous 'Exeter Book' of Anglo-Saxon verse, the Exon Domesday and many other historical documents. Visitor facilities include a well-stocked shop and onsite café, serving a range of light lunches, afternoon teas and light snacks. Nobody has reviewed Exeter Cathedral yet, Be the first. You are submitting a booking enquiry. Exeter Cathedral will then contact you by email with details of availability and prices.